Home eXtreme botany Arachnoid choreography live and kicking in Dr M’s garden! Dr M went all entomological this weekend filming this dramatic real time choreography from a garden arachnid. 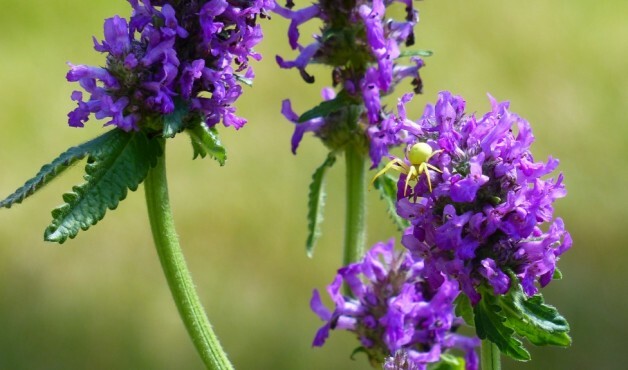 This beautiful Crab Spider has recently made its home in Dr M’s wild betony patch, a surprising choice of home since the vivid purple blooms contrast dramatically with the yellow of the spider! Normally, so Dr M understands, this spider selects more concealing blooms, however it seems quite happy, and although Dr M was puzzed that no serious web spinning had taken place, he has been informed (see comment below!) that, although Crab Spiders can produce silk, they do not spin webs. They normally lie camouflaged and ambush any prey that happens along, so all flies and such like beware! The music that inspired this video is Rebecca Clarke’s sonata played by Raphael Wallfisch and John York and broadcast on radio 3 record review August 2016. Although Crab Spiders can produce silk, they do not spin webs. They normally lie camouflaged and ambush any prey that comes within reach of their long front legs.